What typically comes to mind when you think of sugar-filled drinks? If you can quickly list beverages like Coca-Cola and neon-colored fruit punch, that makes sense ― those drinks are filled with sugar. A can of Coke has a whopping 39 grams in it, while the brand Simply Fruit Punch packs 35 grams per bottle. If you’re eating a standard 2,000 calorie-per-day diet, you should only be consuming about 25 grams of added sugar per day, according to the American Heart Association. So if you’ve managed to give up both Coca-Cola and fruit punch, you’re on the right track. Unfortunately, soda and sugary punches are hardly where the high-sugar drink saga ends. 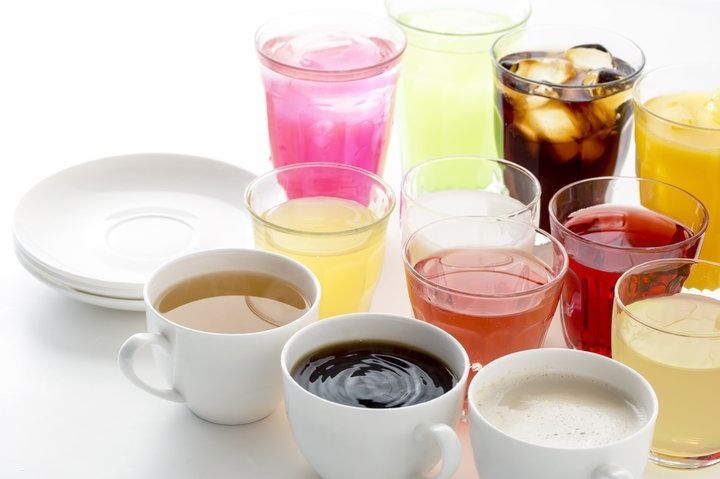 Sugar is hiding in way more beverages than you think. Sugar is incredibly addictive. Some studies have found that it’s more addictive than cocaine. And too much sugar is really bad for you. Sugar consumption has been linked to a plethora of problems, from weight gain to heart disease, diabetes and fatty liver disease. Yikes. In an effort to help demystify what the sugar industry probably doesn’t want you to know, let’s take a look at how much sugar you’re actually drinking, from your favorite Starbucks drink to that “healthy” bottle of green juice you just picked up at your local organic grocery store. Sorry, juice devotees, but whether you’re downing a glass of old-fashioned OJ with breakfast or loading up on green juice in the name of getting your nutrients in, you’re likely consuming quite a bit of sugar. One cup of generic orange juice has 21 grams of sugar in it, and many green juices are filled with sugar as well. For example, Juice Press’ Doctor Green Juice is packing 36 grams of sugar. While coffee on its own doesn’t have any sugar in it, as soon as you start adding in milks and syrups, that changes quite a bit ― and not for the better. A classic Starbucks Grande Mocha made with 2 percent milk has 27 grams of sugar, while an 8-ounce bottled Iced Espresso Vanilla Latte from Starbucks has 19 grams in it. Like coffee, tea on its own is completely sugar-free. But once you start doctoring those tea drinks, your sugar-free matcha can suddenly have 27 grams of sugar (that’s how much is in a grande Starbucks Matcha Lemonade). And at 42 grams, the sugar content in a Starbucks Chai Latte is through the roof. While it is possible to prepare a low-sugar smoothie at home, the bottled smoothies sold at grocery stores are typically pretty high in sugar. Consider a Naked Juice Strawberry Banana Smoothie. Despite not having any added sugar, these smoothies still have 23g of sugar per bottle. Now consider a Naked Juice Mighty Mango Smoothie of the same size and you’ll be even more shocked: It has 57 grams of sugar. While these drinks don’t technically have added sugar, when you serve up fruit in smoothie form, you lose most of the fiber. This means your body will process these smoothies like straight-up sugar. While drinks like coconut water and kombucha do have their health benefits, you’re fooling yourself if you think they’re sugar-free. Popular coconut water brand Vita Coco has 11 grams of sugar per bottle, while gut-healthy kombucha can have quite a bit of sugar in it as well. A 16-oz. bottle of Health Ade pomegranate kombucha, for example, has 14 grams of sugar. So, what should you drink? If you’re thinking the only healthy beverage left is water, you’re onto something ― but you don’t have to chug H20 until the end of time to stay healthy. Happy Gut author Dr. Vincent Pedre said that while some non-water drinks do contain health benefits (and are delicious!) it’s important to become a label detective and steer clear of drinks that have more than three ingredients in them. Does everything besides water contain massive amount of sugar? No, but a lot of it does. So read labels with care, because let’s be honest: Intentionally eating your sugar in the form of a delicious chocolate chip cookie is a lot more fun than unknowingly drinking it. This was the real reason why we started our company. To provide a healthy Chai to consumers that is not laden with sugar. We are proud to say that our completely unsweetened chai is now available in select cafes around Boston. We use 3 ingredients: Tea, Water and Spices in our Chai and you choose the 4th, Milk of your choice. As an astute consumer, you get to decide how much sugar you want to add and frankly, if you have such delicious spices like, cardamom, fennel, cloves, cinnamon and ginger in your chai, may be you might skip adding sugar altogether like I do!